The waterfront center of San Diego is the eighth largest city in America, and includes an MLB stadium, Amtrak Station, soaring skyscrapers, traditional historic buildings, trendy new night clubs, and peaceful parks. Downtown has it all. The popular Gaslamp Quarter is known for hosting the world’s most popular musicians, celebrity parties, and operas. The powerful skyline succumbs to a fleet of aircraft carriers located in the majestic San Diego Bay. Luxury Resorts designed by the makers of Ferrari and Maserati compliment the raving night clubs and the eclectic culture. The San Diego Padre’s Petco Park can house over 42,000 people and has views of the bay and harbor. Venturing through the one-way streets past the stately San Diego Superior courthouse travelers will run into the Horton Plaza Shopping Center. The eccentric architecture that establishes such exquisite style in the area emulates busy vibes of success. Along the waterfront is the San Diego Maritime Museum, with it’s fleet of historic ships and flagship Star of India. At Navy pier is the retired U.S.S. Midway, which has been turned into an aquatic museum. 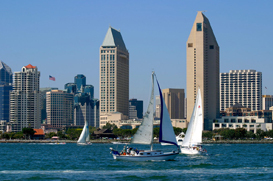 The bay full of magnificent vessels is a neighbor to the Seaport Village shopping center, Marriot Hotel and Marina, and the San Diego Convention Center.